How do I add a new payer? How do I change payers? To pay for ads, add funds to your shared account after you pass moderation. On the My campaigns page in the Shared account section, click Top up. Select your payment method and enter the payer. The minimum payment is 1000 RUB before VAT (values for other currencies). On the My campaigns page, click Payments and documents. Go to the Payers section. In the Create new payer field, select a payer and click Create. On the Register payer page, enter the bank account information and click Register. If you want to change payers when you add funds to your shared account, go to the Issue an invoice page and click change payment method or payer to go to the Select account payment method page when you're checking your data. Select another payer or register a new one and select them. It is not possible to change the payer after you issue your invoice. If necessary, you can issue a new invoice using the correct information. If you want to change payment methods when you add funds to your shared account, go to the Issue an invoice page and click change payment method or payer to go to the Select account payment method page when you're checking your data. Select a payment method. It is not possible to change your payment method after you issue your invoice. If necessary, you can issue a new invoice using the correct information. You can not disable shared accounts. A shared account is set up automatically for new Yandex.Direct users. If the shared account model does not work for your business because you must get separate invoices and make separate payments for each ad campaign, then we will review your request to create a Yandex.Direct account that is not shared. Attention. Your request to create an account that is not shared may be denied. To submit a request, create a new Yandex username, but don't use it to sign in to Yandex.Direct or other Yandex commercial services. Then leave a request using the form below. VAT is added by the seller to the cost of services in accordance with the norms of tax legislation for each country. Total VAT is shown on a separate line in payment documents and documents confirming rendering of services. Advertisers can view statistics for debited funds (both before and after VAT) in the Yandex.Direct interface. Just select the corresponding setting in the Statistics section. It is not possible to transfer money from one username to another. You can get a refund from one username and then use that money to fund a shared account under a different username. 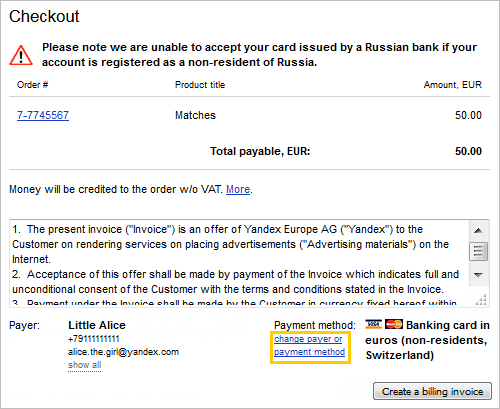 In the Payment methods section, you can learn about all available payment methods for Yandex.Direct campaigns. Complete information on payment transactions with Yandex is available in Yandex.Balance. You can look through invoices under the Invoices tab. Should you have any more questions regarding payment, please feel free to ask using the form below.